Whenever we show folks our favorite coloring books (Girls Are Not Chicks and the soon-to-be-released Sometimes the Spoon Runs Away with Another Spoon), someone always asks whether we sell crayons. So... when we learned about these soy-based crayons, made in America, sold in cute little treasure bags, we couldn't resist. And as soon as they arrived we started coloring with them and were really glad to have them. One of the things I've always hated about coloring is having the crayon snap. Working with special-needs kids, I could see how much more frustrated they would get with those silly snaps! That's another major benefit of this form factor of crayon, they don't snap! So, order up a bag or two as stocking stuffers OR order Girls Are Not Chicks AND a bag of crayons! You'll have a lot of fun. This bag contains eight primary colors and will provide hours and hours of coloring fun. Crayon RocksTM are made in America from natural soy wax, using American-grown soy beans. Non-toxic and conforms to ASTM D 4236. My name is Barbara Lee and I have been teaching children with special needs for 23 years. 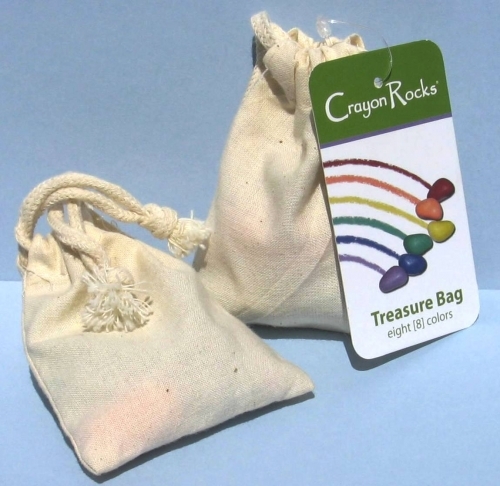 I invented Crayon Rocks after being inspired by Jan Olsen, OTR, and the Handwriting Without Tears program. I learned from her how important it was to develop early a good tripod grip. Handwriting skills depends upon this. A really good crayon should take very little effort in applying great swaths of color to the paper. In fact, that crayon should be as much like paint as possible. Great colors that go on smoothly and easily, helping little fingers to grow strong as they spill their creative ideas on to paper. I wanted a coloring tool that students with grip strength problems and disorders effecting fine motor control could use AND enjoy. It has been lots of fun to see what my students do with their Crayon Rocks.